New York City Divests, now it’s time for New York State! It's 2019, and New York's public pension fund still has $13 billion in taxpayer money invested in fossil fuel companies. These investments directly fund climate change and disasters like Superstorm Sandy. Last year, Governor Cuomo called on State Comptroller DiNapoli to follow the example of New York City and divest the state's public pension funds. Comptroller DiNapoli has refused to do so—which is why we need to turn up the heat. On February 27, activists from around New York will gather in Albany to hand-deliver to the Comptroller thousands of postcards and letters urging him to pull public money out of fossil fuels. Sign the letter now and help build a Fossil Free New York. State Comptroller Tom DiNapoli: I'm writing today to urge you to divest New York's public pension fund from all fossil fuel companies. Many New Yorkers are still recovering from the devastation of Superstorm Sandy—and many of our communities are threatened by dangerous fossil fuel projects like fracked gas pipelines. Public money shouldn't be invested in companies like Exxon that endanger New Yorkers. If New York had divested 10 years ago, the public pension fund would be $22 billion richer today. Divesting New York isn't just the right thing for the people and the planet, it's also your fiduciary obligation as Comptroller. This is your chance to be a real climate leader, Mr. DiNapoli. Do the right thing. Thank you for taking the time to tell NY State Comptroller Tom DiNapoli to divest New York's public pension fund from fossil fuels. Your postcard will be delivered to the Comptroller in person on Wednesday, February 27. Click here if you'd like to join us in delivering these signatures to the Comptroller in Albany on Feb 27. It's 2019, and New York's public pension fund still has $13 billion in taxpayer money invested in fossil fuel companies. These investments directly fund climate change and disasters like Superstorm Sandy. Last year, Governor Cuomo called on State Comptroller DiNapoli to follow the example of New York City and divest the state's public pension funds. Comptroller DiNapoli has refused to do so—which is why we need to turn up the heat. On February 27, activists from around New York will gather in Albany to hand-deliver to the Comptroller thousands of postcards and letters urging him to pull public money out of fossil fuels. Sign the letter now and help build a Fossil Free New York. 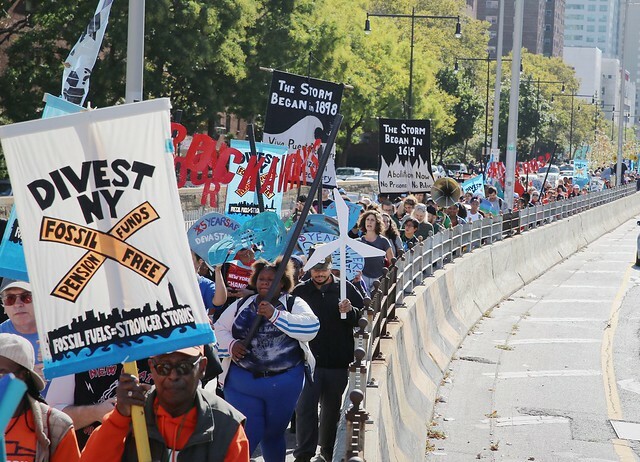 Tell State Comptroller DiNapoli to #DivestNY Now! It’s 2019, and New York’s public pension fund still has $13 billion in taxpayer money invested in fossil fuel companies. These investments directly fund climate change and disasters like Superstorm Sandy. Last year, Governor Cuomo called on State Comptroller DiNapoli to follow the example of New York City and divest the state’s public pension funds. Comptroller DiNapoli has refused to do so—which is why we need to turn up the heat. Thanks for signing! Now triple your impact by sharing this campaign with your friends. 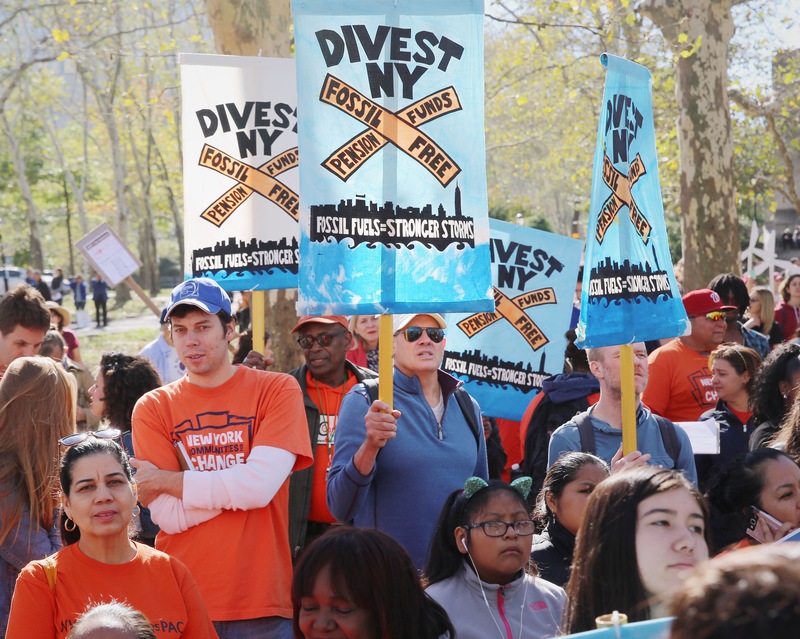 New York City is rising up for divestment – check here for images from all of the amazing work of the #DivestNY coalition! The world is watching New York. Under the regressive Trump administration, we need NY to be a true beacon of safety and sanctuary. New York is one of the world’s financial capitals and home some of the USA’s largest pension funds. While New York City is showing climate leadership by moving forward with divesting from fossil fuel and investing in climate solutions, the NY state pension fund thinks remaining invested and talking to Big Oil (and coal and gas) will help solve the climate crisis. ExxonMobil is one of New York State pension fund’s largest investments at over $1billion, even as New York’s own Attorney General leads the charge in investigating the corporation for what could be the worst case of corporate fraud in history. The state also has over $5 billion invested in companies that frack – poisoning our water, destroying our lands – even though fracking is banned across the state. This is double talk worthy of a Trump not NY. We need New York to step into its climate leadership and inspire a nation. How much $ are we talking? The total combined value of the New York City and State is more than $400 billion, making these amongst the largest pension funds in the United States and world. With more than $13 billion invested in fossil fuel companies like Exxon, Chevron and the companies behind the Dakota Access Pipeline, and the State Comptroller actively opposed to divestment, the state pension remains part of the problem. It’s fueling climate destruction. One of the largest holdings in the state pension funds is the infamous ExxonMobil. Read more about the NY Pension Funds. What is fossil fuel divestment anyway? What’s wrong with the fossil fuel industry? We all live in the fossil fuel era, but it needs to come to an end, and soon — before more irreparable damage is done to our world. Fossil fuels are the main driver of climate change, and behind other major catastrophes such as oil spills, air pollution, contaminated drinking water from fracking, etc. Moreover, companies like ExxonMobil are under investigation for having deliberately misled the public, shareholders and governments over climate change science and risk for decades to protect their profits.